Super Rare Games and Sumo Digital have opened pre-orders for the limited physical release of Snake Pass for Nintendo Switch. Only 4000 copies of Snake Pass will be printed worldwide. Once gone, it’s gone forever. Every copy includes the game, full color art book, interior art, exclusive sticker, and three trading cards. 125 cards have been signed by the development team. Pre-order yours here (ships worldwide) for $34.99 / £29.99 / €33.99. Super Rare Games have today announced their partnership with Sumo Digital to physically release Snake Pass for the Nintendo Switch™. Only 4,000 copies of this blockbuster indie title will ever be on sale and pre-orders open today at superraregames.com. Super Rare Games has gone from strength to strength with their limited print physical games, working with some of the biggest independent developers. Snake Pass follows Worms W.M.D and Mutant Mudds in joining the most curated collection of physical titles on the Nintendo Switch™. Snake Pass is a puzzle platformer where players take control of the lovable and charming Noodle. Only through mastering the smooth control systems will you be able to save Haven Tor. The game was one of the first to land on the console and was the first Number 1 in 16 of the Nintendo eShop Charts, including: UK, Australia, Canada, Spain and France; and reached number 2 in the USA making this limited print copy even more Super Rare. This release also contains all free content updates on the cartridge, including Time Trial mode and Arcade Mode. “Snake Pass is one of the bestselling digital games on the Nintendo Switch and is such an iconic game for the platform having been there right at the beginning. This was one of, if not the, most requested game we have had since we started, so it is very surreal to now be releasing it.” Said George Perkins from Super Rare Games. The Super Rare edition will include a full colour art book, interior art, exclusive sticker, as well as three trading cards randomly selected from the five-card set. Excitingly, 125 of these cards have been signed by the development team of the game – making some copies even rarer. Alongside the release of the game, there will also be an exclusive 12” vinyl soundtrack available. Only 500 have been printed and it features the award-winning sounds of legendary composer David Wise, famous for his work on the Donkey Kong Country series. “When we first launched Snake Pass it was incredible. Not only to be one of the early titles on the Switch, and to achieve the number one spot on the Nintendo eShop in Europe was fantastic. 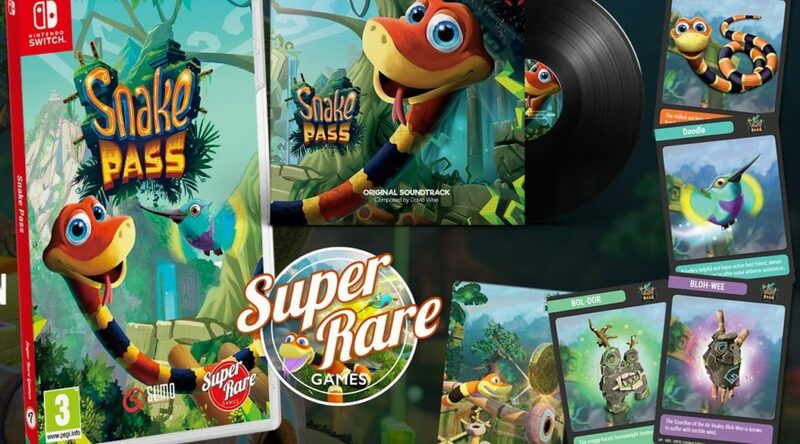 I had no idea how far the game would go and to now collaborate with Super Rare Games on a physical copy of the game is amazing.” said Seb Liese, creator of Snake Pass. Order your copy now at superraregames.com for $34.99 / £29.99 / €33.99.